Republished from the New York Times. Dec. 28, 2009. Cupping their hands near holes drilled for cable routing, workers at the Boeing Company’s four-acre data processing site near Seattle noticed this year that air used to keep the computers cool was seeping through floor openings. Mindful of the company’s drive to slash electricity consumption by 25 percent, they tucked insulation into holes there and at five similar sites. The resulting savings are projected at $55,000, or some 685,000 kilowatt hours of electricity a year. Yet Boeing’s goal is not just to save money. The hope is to keep pace with other companies that have joined in a vast global experiment in tracking the carbon dioxide emissions generated by industry. Boeing and other enterprises are voluntarily doing what some might fiercely resist being forced to do: submitting detailed reports on how much they emit, largely through fossil fuel consumption, to a central clearinghouse. The information flows to the Carbon Disclosure Project, a small nonprofit organization based in London that sifts through the numbers and generates snapshots by industry sectors in different nations. By giving enterprises a road map for measuring their emissions and pointing out how they compare with their peers, experts say, the voluntary project is persuading companies to change their energy practices well before many governments step in to regulate emissions. Scientists estimate that industry and energy providers produce nearly 45 percent of the heat-trapping emissions that contribute to global warming. While some governments are convinced that reining in such pollution is crucial to protecting the atmosphere, a binding global pact is not on the immediate horizon, as negotiations in Copenhagen showed this month. Until broad regulation is at hand, many investors and company executives say, voluntary reporting programs like the Carbon Disclosure Project may be the best way to leverage market forces for change. Continue reading at the New York Times . . . Originally published: 13 February 2009. Two satellites smashed together Tuesday, creating a spreading cloud of space junk that slightly increases the chance that other spacecraft could be damaged by the debris. Satellite 33442 orbits Earth every 91 minutes, circling at an inclination of 56.1 degrees to the equator and gradually slowing down, destined to fall into the atmosphere in late spring or summer and burn up. Aficionados of satellites know that 33442 is a tool bag. A spacewalking astronaut let it slip last year, adding one more tiny, artificial moon to the junk in low Earth orbit. The military has a running catalog of more than 19,000 pieces of orbital debris. This week, the census of space schmutz suddenly jumped by 600 — the initial estimate of the number of fragments from Tuesday’s stunning collision of two satellites high above Siberia. Space is now polluted with the flotsam and jetsam of a satellite-dependent civilization. The rubbish is increasingly a hazard for human spaceflight and has put important equipment such as the Hubble Space Telescope and communications satellites at risk of being struck by an object moving at hypervelocity. 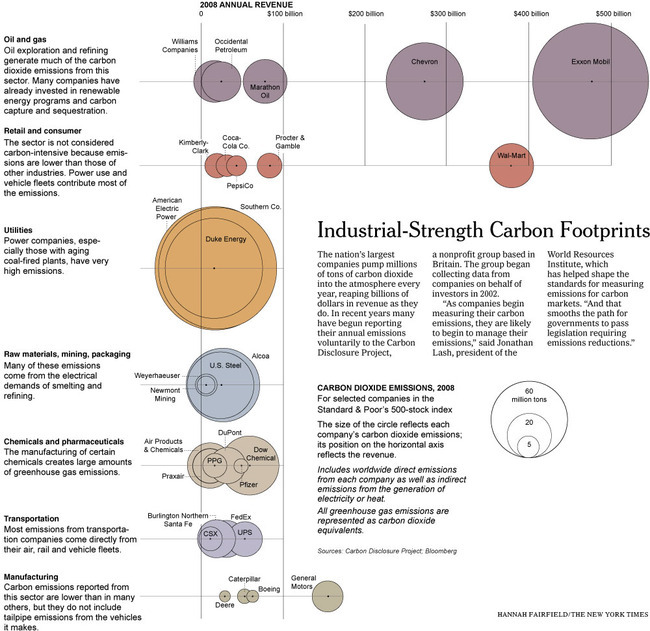 Global carbon markets worth USD $60 billion (€40 billion) in 2007, up by 80 percent from 2006. The total traded volume increased by 64 percent from 1.6 Gt (1.6 billion tons) in 2006 to 2.7 Gt in 2007.
carbon emissions (CO2e) transacted during 2008, up 56 percent from 2007. There seems to be a generally bullish sentiment on carbon, not necessarily reflected in current market prices. Survey respondents now on average expect a carbon price of USD $37/ton (€24/ton) in 2010 and USD $ 54/ton (€35/ton) in 2020, which is USD $9 (€6) and USD $15 (€10) higher, respectively, than they expected a year ago. This demonstrates that market participants now realize that the EU ETS will face a considerable shortage and that much of this will have to be met through reductions taking place in Europe.